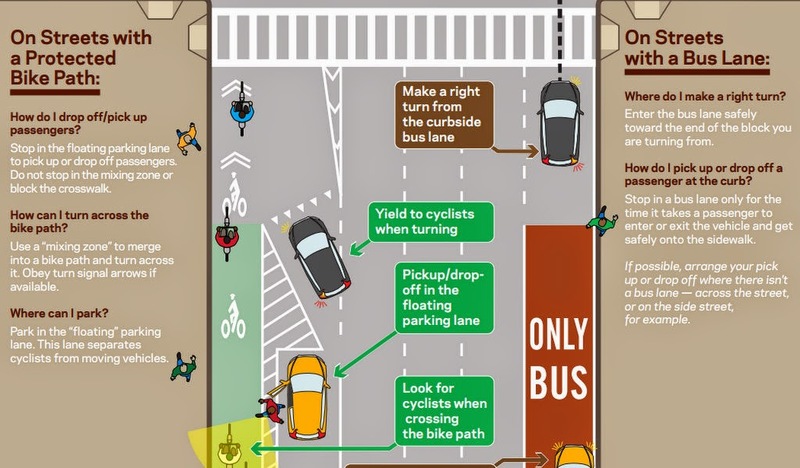 In NYC, the DOT has declared the left turn mixing zone as the default treatment for a protected lane. In the examples provided, bike lanes are continuous on the left side of the one way streets and the left turn is added with yield markings for the vehicles. Average progression speeds and the speed limits of the one ways are 30 MPH, (the Vision Zero goal is to reduce to 25 MPH). Heavy turning >150 vehicles per hour are considered as a threshold for when to provide a protected movement for the left turn. The City likes the protected pedestrian movement that the left turn movement provides (separating turns from the pedestrian WALK indication). New York City doesn't use vehicle detection, so there's impacts associated with the left turn every cycle. Bicycle volumes are not explicitly considered as a part of their consideration for the control strategy, which while good policy may be something that the engineering community may struggle with in terms of warrants. There is a flyer they have used to describe the intended outcome on the street. It seems a simple opportunity to is reduce the signal timing progression speed would be likely to improve yielding.